Malus Pink Glow, also known as Malus Dolgo, is named for its elongated dusky pink fruits, which form in plum-like clusters in September. The fruit is on the larger size for a crab apple, making it easy to use in the kitchen - it is perfect for crab apple jelly and a good source of pectin for other fruit jellies. The blossom is plain white but borne in profusion early in the apple-blossom season, making Pink Glow an excellent pollinator for all early-flowering apple varieties. Fill in the details below and we will let you know when Dolgo crab apple trees are back in stock. 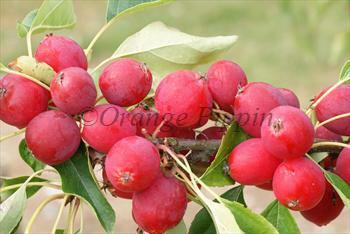 Malus Dolgo / Pink Glow has good all round disease-resistance, and is a generally hardy tree. It can be grown in zone 4 and possibly zone 3. Widely known as both Malus Dolgo and Pink Glow.